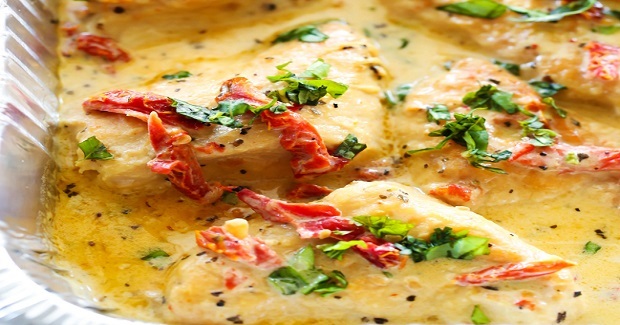 Slow Cooker Creamy Sun Dried Tomato Chicken Recipe - Gutom Na! Posted on Tuesday, June 28th, 2016 at 6:43 pm. Heat large skillet over medium high heat. Add olive oil. Combine flour, salt, and pepper. Dredge chicken in flour mixture and place in skillet. Brown chicken on each side for 2 minutes and place on the bottom of slow cooker. Add chicken stock, sun dried tomatoes and basil. Cook on LOW for about 4 hours or until chicken is cooked through completely. Add heavy cream and serve.